The Help for Heroes Mid Season Sale is now on. Featuring many of our timeless classics, new lines and a mixture of mens and womenswear, this sale has something for everyone. SALE ENDS ON 14/04/2019. New for 2019 is our 'Challenge Yourself' Sports Collection. Featuring our new branding and an entirely re-designed look, this collection includes cycling gear, running and general sportswear. The entire collection is made from high-performance materials, brilliant for every sporting need. Get Free P&P on all orders on our online shop using the code 0319FREEPP. Combine with our current classics sale to pick up a great discount and save on delivery. THIS CODE EXPIRES ON 31 MARCH. This half term, we've decided to give 20% off across selected lines. This brilliant saving applies to some popular new lines as well as old favourites in clothing and accessories. THIS SALE ENDS ON 03/03/2019. 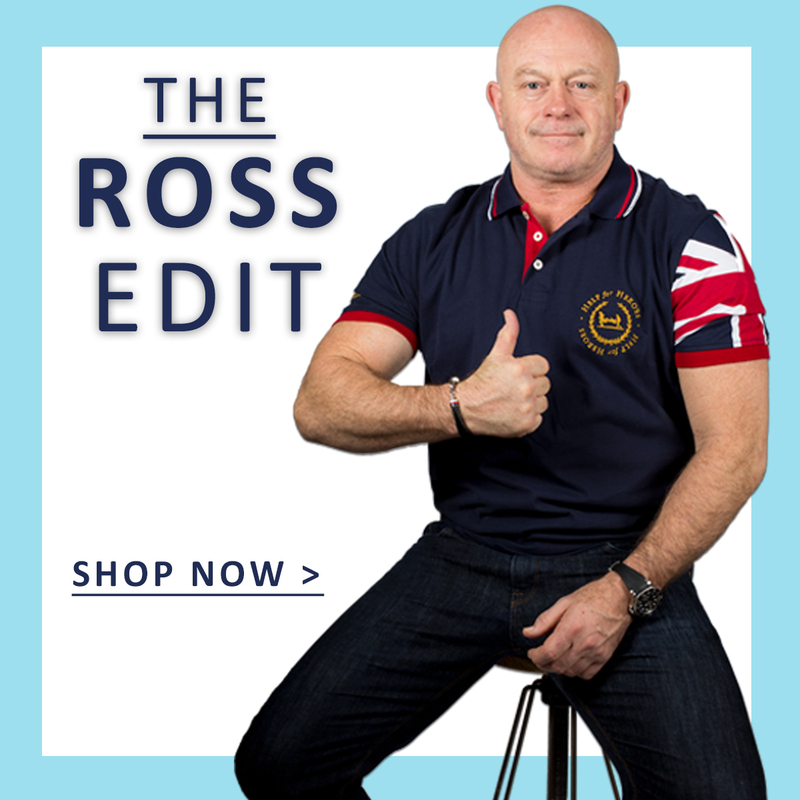 We've put together an exclusive Ross Edit featuring our patron Ross Kemp. Ever since we launched a range of products featuring Ross, the sales generated have been much higher than usual. This time we've used some of our new products and premium lines combined with some old favourites and it's having the same effect. Pass this onto customers to inspire them to shop and show their support. 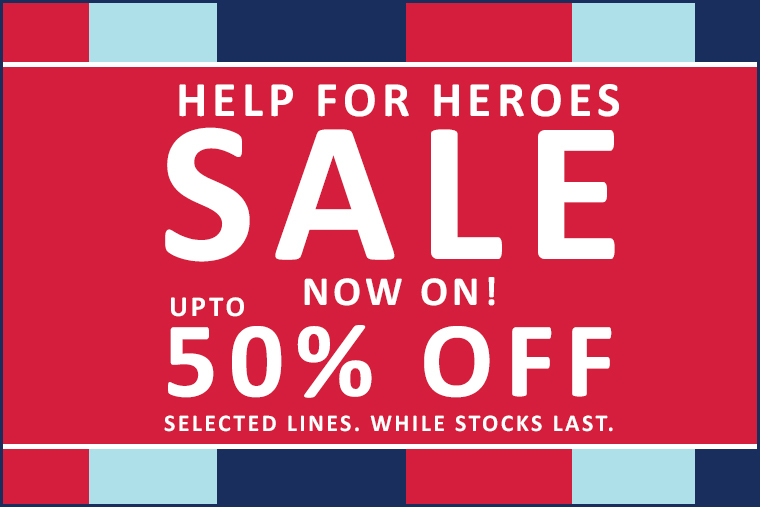 The Help for Heroes 50% off sale continues and we've categorised all sale items by price (the links can be found below). Customers will be able to find varied discounts across our online store and grab a great product at the fraction of the original price. SALE ENDS 31/01/2019. The Help for Heroes 50% off sale continues! We have added further reductions meaning customers can save even more on popular clothing, accessories and food items. 50% OFF SALE ENDS ON 31/01/2019. Customers can now get up to 50% across all Christmas lines in our online store as part of our countdown to Christmas. These discounts also run to the end of January 2019 (while stocks last). THIS SALE STARTS ON 14/12/2018 and ENDS ON 31/01/2019. LAST DATE FOR CHRISTMAS DELIVERY IS 18/12/2018. Another week, another Christmas Countdown Deal. This week we are giving customers up to 20% off gifts including Christmas decorations, jumpers and other gifts. THIS SALE STARTS ON 07/12/2018 and ENDS ON 16/12/2018. With Christmas creeping closer and eager customers already in the swing of shopping, we are counting down the days! We are giving discounts of up to 40% off across many of our lines on our online store. THIS SALE STARTS ON 3/12/2018 and ENDS ON 9/12/2018. We are giving customers 20% off women's clothing lines across our online store while stocks last. To use the discount enter the code SNOW13 at the checkout. This code is valid from 30/11/2018 to 02/12/2018. Can also only be used on full priced women's clothing items. The code for November is 11H4HPPFREE. Apply the code at the checkout for UK standard delivery. The code does not apply to international or next day delivery. Customers can combine the savings in the Mid Season Sale with saving on shipping to grab a bargain. Plus, our Christmas clothing is now in! This code expires on 30/11/2018. We've come to the halfway point in our Autumn/Winter season. So, of course, it's time for our Mid Season Sale! Customers can get up to 50% off selected lines including classic favourites and popular new products. SALE ENDS ON 11/11/2018 (this may extend). Christmas isn't far off. Stores have already begun showcasing their displays and consumers are getting ready to stock up on seasonal products. In preparation for the holidays, we are offering customers a 25% discount across our popular Christmas card lines. DISCOUNT ENDS ON 28/10/2018. For this August Bank Holiday, we're continuing to offer up to 60% off selected lines in our online store. We're discounting some of our favourites as well as a few new lines that are proving popular. Not only that, but it's FREE UK P&P as well! SALE ENDS 28/08/2018. 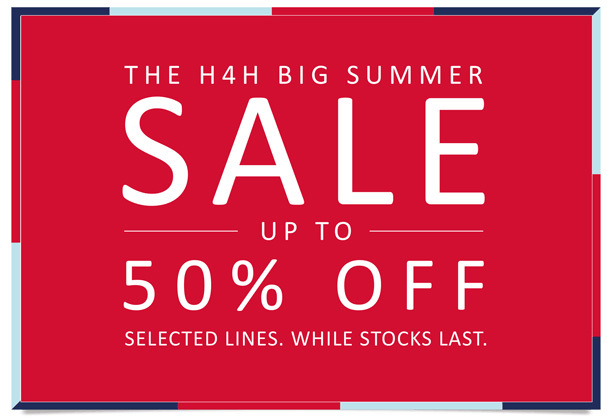 Help for Heroes Summer Sale - Further Reductions of up to 60% off and Free UK P&P. We're giving customers further reductions of up to 60% off selected lines this summer (while stocks last). This really is a fantastic chance to grab a high-quality hoody, t-shirt or accessory for a fraction of the price, all while showing support for our Heroes. VALID WHILE STOCKS LAST. We're also giving customers Free UK P&P this month (USE CODE: 0818FREEPP). Next week, we're launching our BIG summer sale! Customers can get discounts of up to 50% off across selected lines in our collection. The summer sale starts on 16/07/18 and ends on 19/08/18. Net yourself a t-shirt. Up to £5 off in the Help for Heroes Sale. This week we're giving customers up to £5 off selected T-shirt lines. With the warm weather showing no signs of ending soon, it's a great time to pick up a t-shirt and wear your support. THIS SALE ENDS ON 08/07/2018. The code for July 2018 is 0718PPFREE. Apply the code at the checkout for UK standard delivery. The code does not apply to international or next day delivery. Featuring some of our best-selling hoodies, t-shirts as well as some new looks to wear for the summer and autumn! On 22nd June, it's National Bring Your Dog to Work Day! To mark the occasion, we are giving our customers 20% off selected pet products. These include toys and branded harnesses and ID tags. SALE ENDS ON 24 JUNE 2018. This week, we are giving customers the opportunity to get a Help for Heroes Polo Shirt for £20 or less. The discount applies to all men's polo shirts in our store with some products offering savings of £8. With summer in full swing, you can't go wrong with a comfortable polo shirt. SALE ENDS ON 24 JUNE 2018. 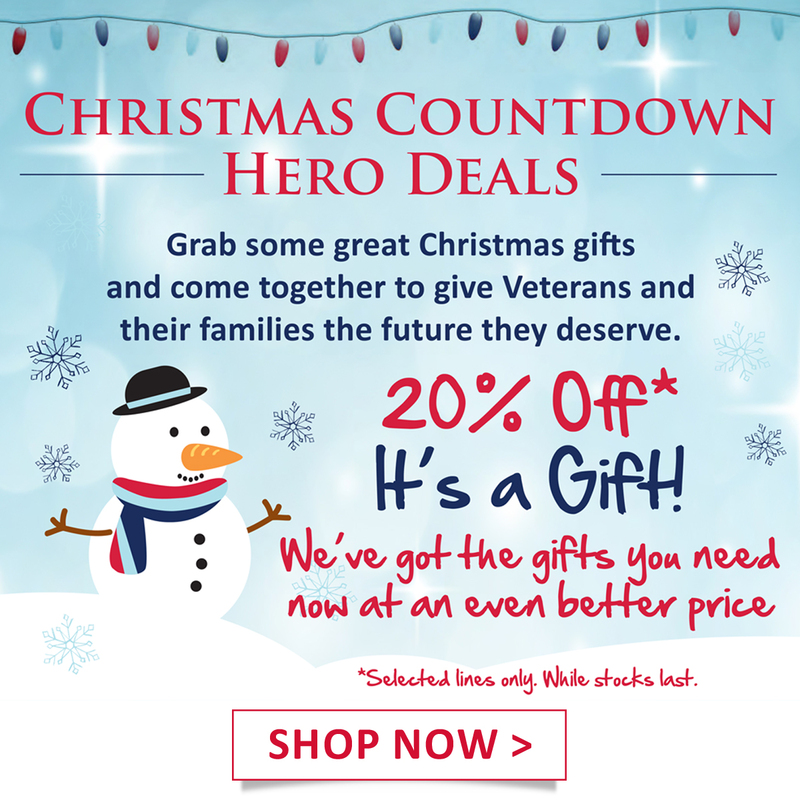 The Help for Heroes mid-season sale is here It's a fantastic chance for customers to get up to 50% off a great selection of our best-selling products. With spring starting to finally get underway and summer around the corner, it's a brilliant time to grab a bargain. We've got free UK standard delivery for all Affiliates in March. Get our new spring collection of hoodies, t-shirts and gifts delivered direct to your door with a free P&P code. The free delivery code is SPRINGFREE. Please share this with your customers and service users. The code is valid only for the month of March although next day and international delivery is not included. Don't forget to replace '!!!id!!!' with your publisher ID. If you have any questions about the program then please do not hesitate to get in touch with us. 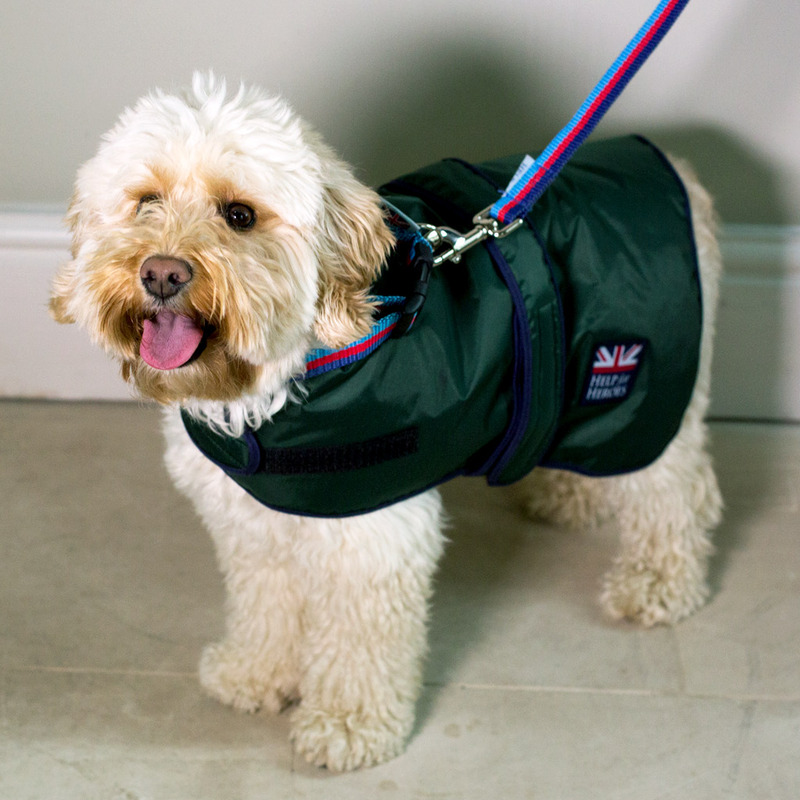 We’ve re-launched our pet collection with a new range that your dog will love. 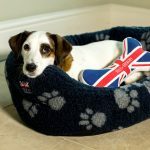 With fun H4H pet toys for throwing and chewing; comfy fleece blankets and beds; wipe clean waterproof coats; tri-colour collars and leads. They come in a variety of sizes to fit all breeds, from terriers to Newfoundlands. Our furry friends have tried and tested them and given them a paw print of approval. So now your pet can show their support too! Don’t forget to use our exclusive Affiliate offer of 20% off everything until the end of February with discount code HERO13. Please remember to replace !!!id!!! with your publisher ID to ensure sales are tracked back to you. If you have any questions about the program, please do not hesitate to get in touch with us.